Aldo Serena, one of the two Italian players who most felt the agony of defeat after the Azzurri suffered the pain of losing at the semi-final stage when the football World Cup last took place on home soil, was born on this day in 1960 in Montebelluna, a town in the Veneto. The match that ended the host nation's participation in the Italia '90 tournament took place in Naples against an Argentina side that included the local hero, Diego Maradona. It was decided on penalties after finishing 1-1 over 120 minutes. Italy converted their opening three penalties, as did Argentina. Then Roberto Donadoni’s shot was saved by the Argentina goalkeeper, Sergio Goycochea. Up stepped Maradona, who scored, to the delight of many in the crowd who had divided loyalties. Suddenly, everything was down to Aldo Serena, who could not afford to miss if Italy were to stay alive in a tournament in which they had played football at times that deserved to win. Serena, the Internazionale striker, had been a fringe player for Italy throughout the tournament, picked only as a substitute, although he had scored in that capacity against Uruguay in the round of 16 – on his 30th birthday. He had said since that he never wanted such responsibility, but Azeglio Vicini, the Italy coach, said there was no choice. 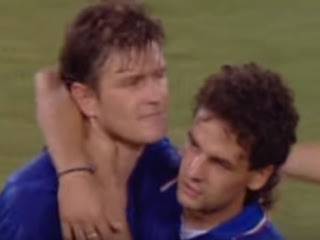 Gianluca Vialli and Giuseppe Giannini, who would have been chosen ahead of Serena, had both been substituted, while Toto Schillaci, who had emerged as Italy’s talisman during the tournament, had finished extra time with a groin injury, which Vicini felt might be too big an impediment. Serena had scored more than 100 goals during his Serie A career. He knew what it took to put the ball in the net. Yet though hit a firm enough shot Goycochea read his intentions, diving to his left to smother the ball. Unlike Donadoni, who had dropped to his knees, head in hands, Serena remained upright. Hands on hips, he tipped his head back and looked towards the heavens. Goycochea ran past him, eager to join his team-mates as they celebrated their passage to the final. Serena had not done too much wrong throughout the tournament so to be held responsible in some ways for the Azzurri demise was unfair. Twenty-four hours later, it would be the turn of Stuart Pearce and Chris Waddle to be Donadoni and Serena as England were knocked out by West Germany, also on penalties. Yet at that moment it must have seemed there was no consolation or comfort available. The hopes of a nation had rested on his shoulders and he had not been able to deliver. No wonder he left the field in tears. The moment should not have defined his career but it has tended to overshadow his achievements, which were not inconsiderable. He won the Serie A title no fewer than four times, with Juventus (1985-86), Inter (88-89), and AC Milan (91-92 and 92-93), although his contribution to the two Milan championships was minimal because of injuries. A powerful, athletic centre forward with good aerial ability and a fierce shot in his left foot, his best years were at Inter, where he was Serie A’s leading scorer in 1988-89 with 22 goals. 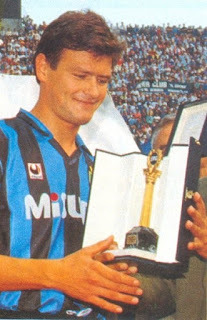 Yet fans of the nerazzurri found it hard to forgive him for joining their arch rivals AC Milan under Fabio Capello. He retired in 1993 as the only player to have played for both Milan clubs and both Turin clubs, having spent part of the 1984-85 season on loan with Torino. Nowadays he works as a TV pundit. 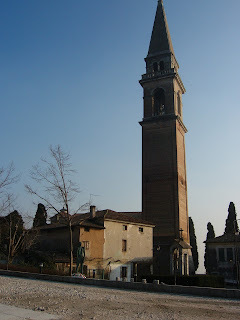 Montebelluna is situated about 22km (14m) northwest of Treviso and about 67km (42m) from Venice on the way to the Valdobbiadene wine growing region famous for prosecco. A pleasant, orderly town, it is best known for its long tradition in the footwear industry, particularly the production of sports footwear, from ski boots to football boots. There is a museum dedicated to the industry in Vicolo Zuccareda, not far from the church of Santa Maria in Colle. The international sportswear giant Nike has a factory nearby, while another, Fila, has a research facility based at Montebelluna. 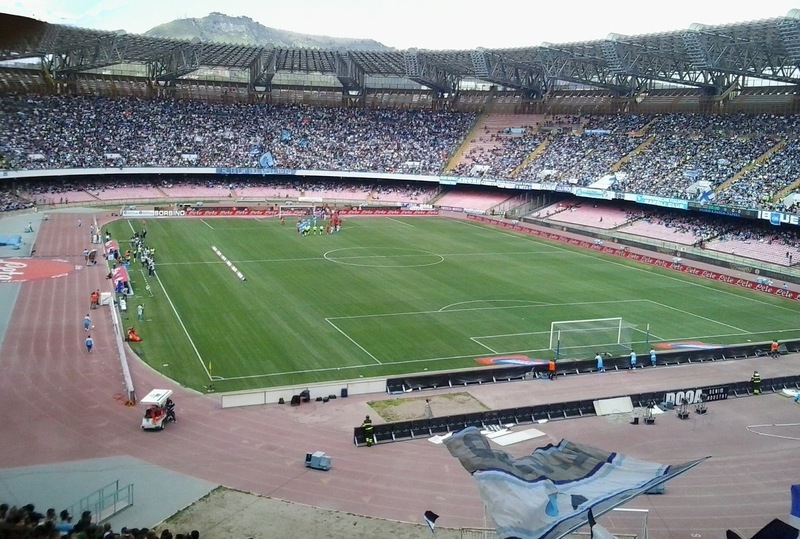 The football stadium in Naples, where the 1990 semi-final took, place is the Stadio San Paolo, built in the Fuorigrotta neighbourhood on the north side of the city and completed in 1959, more than 10 years after work began. 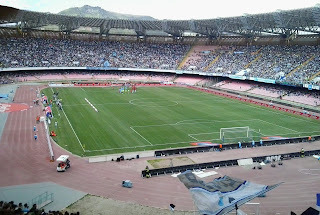 It is the third largest football ground in Italy with a capacity of 60,240. Diego Maradona played there for SC Napoli between 1984 and 1991, helping the club to the most successful period in their history, in which they won the Serie A title twice, the Coppa Italia and the UEFA Cup. The local council wanted to rename the ground Stadio Diego Maradona but Italian law prohibits the naming of a public building after any person who has not been dead at least 10 years.